The Mount Vernon Co., a Boston-based apartment owner, and developer, this week filed expanded plans with the city regarding its proposed 132-unit residential complex on Western Avenue in Brighton. The company is planning a 128,052-square-foot, six-story residential building with three retail stores at 530 Western Ave.
“The property is situated at the gateway to Brighton from Watertown at the edge of Western Avenue,” wrote Seth Lattrell, an environmental planner with an engineering firm, in an expanded project notification form filed with the Boston Redevelopment Authority on Jan. 4. 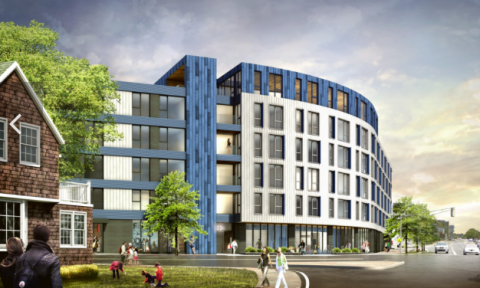 Cambridge-based Prellwitz Chilinski Associates designed the 530 Western Ave. complex, which is also set to include 108 parking spaces, storage for 132 bikes and a rooftop multipurpose room and fitness center. The apartment complex is about a half-mile away from Boston Landing, the large-scale mixed-use development that's home to New Balance Athletics' new headquarters and is also slated to include residential and office space. Mount Vernon owns 10 apartment developments in the Allston-Brighton area.